Krüger's 'Art Tour' 2014 commenced in Austin where collectors and fans had the chance to see many new works from Sebastian Krüger at Art on 5th Gallery on 3005 South Lamar. Krüger arrived in Austin to attend the VIP and public viewing. Over 200 art collectors and fans from the US attended this show incl. Austin-based film director Robert Rodriguez. A special thank you to Joe, Haley, Mary and Todd for the lovely evening. The next show of Sebastian Krüger's 'Art Tour' will be in Potsdam/Germany. Dates and details of more upcoming will be announced soon. Don't miss the opportunity to meet International Rock Star Artist Sebastian Krüger as he unveils his new collection of provocative iconic portraits at his premier 2014 USA One Man Show. 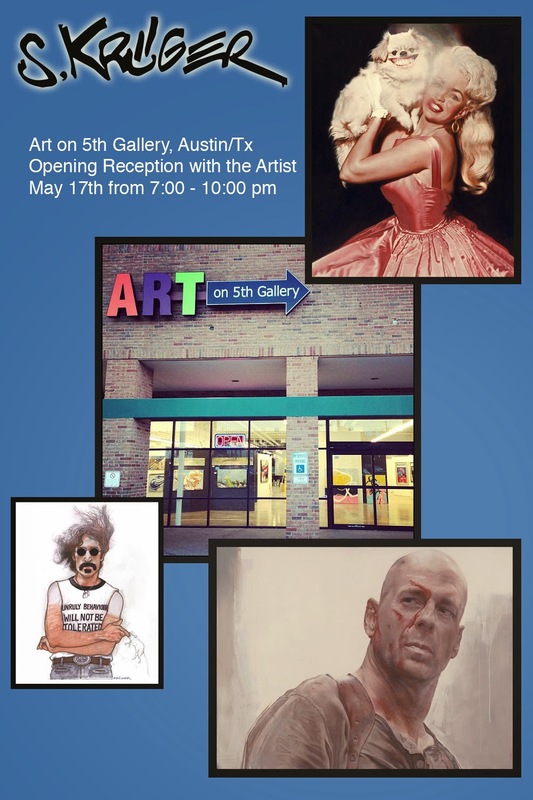 The show will feature new and recent works and newly released limited edition prints.